After the last broadcast in October 2000, it was necessary to wait 42 days to see if there were any complaints from listeners. We have to keep recordings of the broadcasts for that time as part of the license requirement. During the wait, we had the opportunity to speak to as many people as possible to gather as much opinion from members of the community as possible. We were fortunate Barton, Tredworth and Eastgate Community Trust came to our financial rescues with the funds, but we had to repay the trust out of the funds we were lucky enough to receive. This meant we would have to start from scratch to raise funds for the proposed Broadcast to coincide with the Gloucester Festival and Jamaican independence celebration 2001. Immediately after the 42 days elapsed we started work on the license application for the broadcast. We were determined things would be different should we secure another license. One of the first things we had to sort out was a better location for the transmitter. One of the more consistent criticism received was some areas of Gloucester was not able to hear us. To be able to site the transmitter higher we needed a very high building and a letter confirming we could site the transmitter. We were extremely happy when Andrew Harley confirmed he and the committee had agreed to our request to site the transmitter on this particular building. The letter confirming this came via Shayne Hembrow, the former Housing Services Manager, Gloucester City Council. We needed another letter confirming the studio would be sited at the Barton &Tredworth, Community Resource Centre, Conduit Street, Gloucester. Howard Francis, the manager of Barton and Tredworth Development Limited provided this. The license application was submitted December 2000. Another license was also required from JFMG, because we intended to use a stereo link system with the transmitter. This system is deemed to have better coverage if the transmitter is sited as high as possible. It was hoped this would eliminate the possibility of some areas of the Gloucester not being able to hear us. We also planned to broadcast for the full twenty eight-days. Our previous broadcast was only for twenty-two days. The news would be broadcast, and we would make better use of the computer. All these changes meant more internal training would be required, therefore the studio and transmitter equipment would have to be hired for five weeks. The extra week, we hoped would help new and old presenters to get familiar with the equipment. We the committee knew there would be more work involved to deliver a better service than our previous broadcast. With the changes came additional costs. We hoped to secure the license early January, this should give plenty of time to secure the funds needed to broadcast again. Securing funds was again to prove one of the most difficult and testing times for GFM yet again. However, we set about working to the project plan. By the time Derrick met with presenters in April, we were already looking at contingencies. We had received some grants but it was not enough to deliver the broadcast. We were hoping our application for “piece of the SRB6 cake” would be successful by the next meeting with the presenters in May. When we did not receive a piece of the cake, the broadcast looked very very unlikely. However, when we were beginning to think all was lost, Jonathan Magee would find something we could apply for and assisted Carol with numerous grant applications. Things really started moving when the Chelsea Building Society offered to print the publicity material for us. I must say a big thank you to Darren Stevens and Liz Artner for making this possible. From then some sponsors began to reply to our letters and grants were starting to come in, GFM would once again serve the community. On Monday 2 July the first part of our training plan commenced at Gloscatt, Brunswick Rd, Gloucester. 8 of the GFM family were booked to attend the two-day media course, we hoped would help the new presenters. Unfortunately some of the new presenters felt it did not really prepare them for the real thing. Thursday 5 July the studio equipment and aerial should have been installed. However only the aerials were installed. Most of the studio equipment was installed Friday 6, unfortunately not all the equipment was installed. One week of internal training started on Monday 9 July 2001. With so many changes to the way programmes would be presented it was inevitable, presenters would be nervous. After all is said and done they are amateurs giving up their time to present various types programmes to our multi cultural community. The GFM in house training team of Glen Brown, Martin Rafferty, Jerry Hipkiss and JJ Watkins did a excellent job in delivering the training to 24 presenters. In fact they did such a good job presenters were even more nervous. We gathered Sunday evening had a few drinks and prepared for broadcast Monday 16 July 2001. On Monday 16 July, GFM live and direct to the city of Gloucester and who ever else was able to tune in. This broadcast was always going to be different from the previous one. The mere fact that there was new presenters and structures to work to seemed to create problems for some presenters. There would also be more use of the computer during each programme. It seemed like there was enormous pressure on everyone to be better than we were before. Once we switched the transmitter on it became noticeable that the quality of the output could be better. It was pleasing that so many presenters and members of the community made contact to bring this to our attention. The majority of listeners wanted us to do well and some time it seemed to some people that they were nit picking. As far as we are concerned it was pleasing to hear so many people voice their opinions. At least we knew they were listening. Everyone did the best they could. This was all we could ask of each presenter. Unfortunately our presenters are their own biggest critics. GFM sounded so professional it was frightening. The use of the computer brought about some interesting conversations, not only with some presenters, but also the management committee. I believe that by the end of the broadcast each presenter realised its use made things a lot easier for them to present their show than last time. I must say a special thank you to one of our presenters, Martin Rafferty who took the responsibility for supervising the in house training on the computer. Change is always difficult for some people, however most radio stations rely a lot more now on computers than before. Unfortunately, we never maximized the usage during our last broadcast, hence the nervousness. Everyone adapted to using the computer quickly and did well and did us proud. We now have our own website up and running (www.gfm.org.uk). It’s always pleasing when people from the community hear about GFM then offer their expertise. GFM is continually developing and the website will enable us to provide information for the community when we are not on air. Sam Copland did an excellent job and I must formally thank him for his hard work and dedication to Gloucester FM. We are particularly pleased with the way the Community Link programme ventured more into the community to get their opinion on issues that might affect all our lives. Carol trained the community link team in editing, scripting, interviewing techniques, etc. This is a direct result of the excellent training Carol received at The CEED Multi Media Centre in Bristol last year. There were 15 in the team and the age ranged from 15-upwards, Well done Carol. Since coming off air we have noticed other radio station are trying to serve the community. We are proud to say GFM is “With the people for the people” all the time not some of the time. Even more pleasing was the way Mr. Westcarr educated the inhabitants of Gloucester, on the history of Jamaica and Jamaica’s Independence. Gloucester is twinned with St Ann in Jamaica. Mr. Westcarr’s information spot on the community link show became compulsory listening. During our broadcast Carlos Docksey covered other programs. Some at very short notice and in some instance did a better job. Quite a few people from the community stopped me in the street to tell me this. When the community speak we listen. I was also pleased that some of the presenters just went ahead and organised cover for their programmes themselves if they were not able to present their show. There is a real feeling of togetherness within the GFM family. 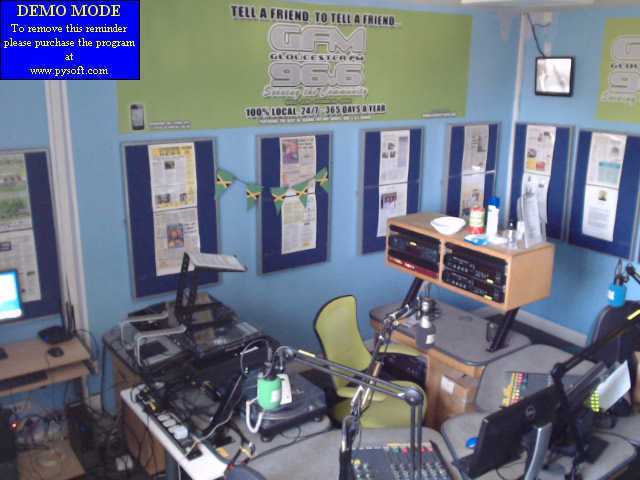 The GFM family gelled well with the new presenters and ensured they had support. This was very important to us. We are proud to say GFM reflects our multi cultural community and are a good example of equal opportunity. The majority of the people I’ve spoken to commented on how professional we sounded this time. The aim is to keep on improving with each broadcast. I’m sure you’ve heard the saying, “Things can only get better”. I really hope we can. We received enormous support via emails, text messages (727), and so many telephone calls to the studio that the log sheets got misplaced. We even had a letter from Jane Henderson, Regional Director, Government Office Southwest. She was very impressed with GFM. This was despite her vigorous grilling by the community link team. I realised GFM was raising interest throughout the area when I received a telephone call from a reporter working for the Cheltenham Echo. He wanted to know why GCHQ had chosen GFM for their recruitment advertising campaign. This was a real scoop for us. We also ran the advertising campaign for the MOD. It is my belief we were chosen by both government agencies because are providing a service that is representative of the Multi Cultural community we live in. The Barton & Tredworth Community Resource Center will be closing shortly for the refurbishment work to commence. On completion we should have a much better environment to broadcast from. The work should take approximately six months to complete. I’ve asked if we can keep the same telephone number and I’m hopeful we will be able to retain the same number. If GFM is to continue serving the community and deliver a better service, we must purchase the equipment. The cost of the equipment is approximately £25.000.00. We seem to encounter technical problems with the signal and equipment, before and during broadcast each time we hire. With the equipment permanently in place we would hopefully eliminate these problems. We could also deliver longer and better training to new and existing presenters. We also need to seriously look at attracting someone who is going to seek funds and actively promote Gloucester FM to local businesses. The running and managing of GFM is becoming a full time job. We are again going through the process of looking for funds, therefore there might not be another broadcast. Only time will tell. The refurbishment of our Spiritual home in Conduit Street is also an important factor. We would like to have an open day before, during or after another broadcast. Gloucester FM is always looking to provide hands on training to potential new presenters who can go on and pursue a career in broadcasting. But if you are a keen amateur and would like to get involved all you need to do is submit a audio demo on CD, midi disc, cassette or email us. You can also telephone me on 07939 284 467. It’s very encouraging that some of our presenters are being asked to provide training or give demonstrations since we came of air to a cross section of the community. We are hoping to keep our website regularly updated with information as and when we have any. We will keep you informed of events involving our presenters that should ensure you can have a good night out. Remember www.gfm.org.uk is our information network linking us to the community while we are off air.